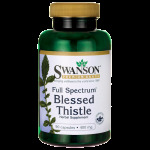 Swanson Blessed Thistle contains many vital nutrients among which vitamins of the B-complex, as well as essential minerals. 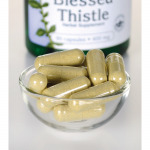 The herb is called “blessed” and there is a reason for it – it has been used since ancient times as a traditional supplement to “bitter” energising drinks for boosting appetite and supporting healthy digestion. Blessed Thistle is to be found in Europe and Asia. Nowadays it has the same effect as it had hundreds of years ago. Apart from bolstering digestion, this herb is often used to restore the balance of female hormones. Other ingredients: Gelatin, stearic acid, may contain one or both of the following: magnesium stearate, silica. WARNING: Do not take this product if you are pregnant or nursing or if you have ulcers.